Lots of thanks to Olivia for being so prompt and easy to work with! I described what I wanted and within a day I had my button exactly as I had envisioned it. If you'd like to add my button to your blog, you can get the code right over there in my sidebar. And I'll leave you with one more sad reminder that summer is over and school has begun. The texture tuesday theme is back to school. I decided to go with a bouquet of pencils. Anybody remember the quote from You've Got Mail? It's my second favorite quote from the movie. The one about daisies is first probably because it's so true. "Don't you love New York in the fall? It makes me want to buy school supplies. I would send you a bouquet of newly-sharpened pencils if I knew your name and address." I just have a little more trouble relating to this quote since it's 100 degrees and humid when school starts around here. But I love it anyway. 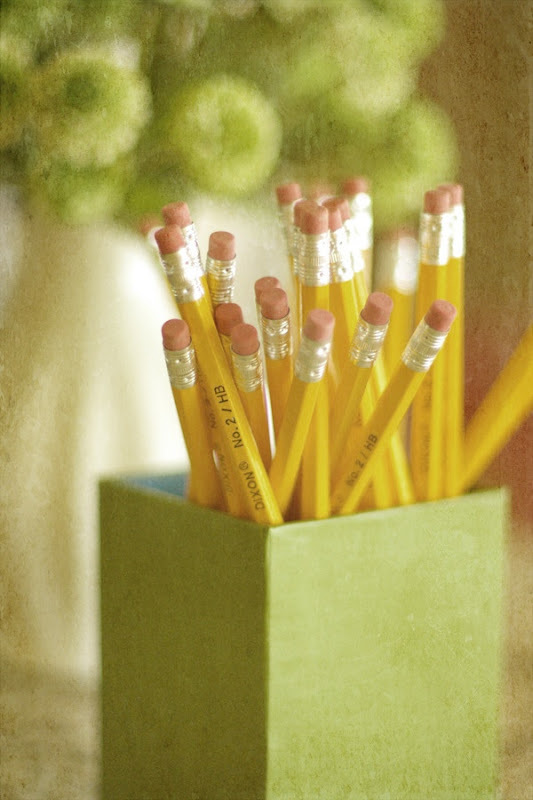 Who doesn't like the thought of a bouquet of pencils?! 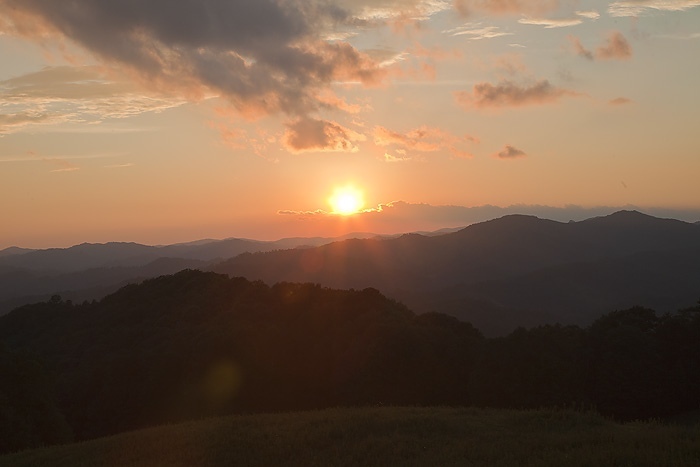 And because this post seems way too wordy for me with too few images, here's a sneak peek at what I'm going to be posting soon... sunset pics from the mountains. Deb, I love your bouquet and the texture work that you did to your composition. Okay...I can actually smell these pencils. You did a great job on the texture and the shot is awesome. WOW...what a sunset. Gorgeous! Love the new button, too! You have a sunset over the mountains and I have a sunrise over the ocean. Love! Love your new blog button...congrats!! And your pencil bouquet is wonderful, new school suppplies, one of my fav memories. Love the pencil shot and I'm loving your new button! Love your bouquet and texture! Your sunset picture is awesome. I love sunsets. yay for your blog button- it's adorable! I had not heard the pencil quote before, but it is charming, especially with that totally cool textured photo to go with it. I wish I lived near the mountains - although I don't think I could trade my city for anything! LOVE. LOOOVE your blog button! Yay! The pencil shot is lovely, btw!! Such a pretty button! Love it! Love that blog button! And the bouquet of pencils is very cool. I don't remember lines from movies too often, so I'm glad you included it. :) Gorgeous sunset photo also! Love your new button! And You've Got Mail is one of my all time fave movies! your new button is beautiful...and i love the signifigance of your name on it too! your pencil texture photo is amazing. I love the smell of new pencils!!! Any excuse to buy stationery and I'm there! I love your photo's and your words too! Great to meet you and your blog, love it! LOVE the new button Deb- it's perfect for you & your blog. I agree with you on how it feels this time of year- certainly not like fall here either. 111 on the forecast for today. Come on cooler weather!!!!! So looking forward to that. Love the new button and will be grabbing it! And I love school supplies. A bouquet of pencils sounds fabulous! Can't wait to what else is coming up. Love the cool colours and quiet composition of the pencil bouquet. A fantastic theme shot for TT. I love the textures and it's a beautiful bouquet. Congrats on the blog button, it looks great! Great photo of the pencils~very creative! Gorgeous sunset! Such a great post! Congrats on the button...very sweet! And also very sweet is your interpretation of this weeks TT theme! LOVE the crazy awesome bokeh and textures! Well done! A bouquet of pencils - great idea!! I love this post! First, your button is awesome! Second, I love, love, love You've Got Mail. That's a great line! And your photo goes perfectly with it! What a fun time of year! It's one of my favorites, even if it is still crazy hot! Love the bee connection! And that pencil photo is awesome. I have a serious office supply addiction ;) And that sunset is gorgeous! I love You've got mail too. Your bouquet of pencils is fabulous. Please send some heat over to the UK? I am fed up of our rain!